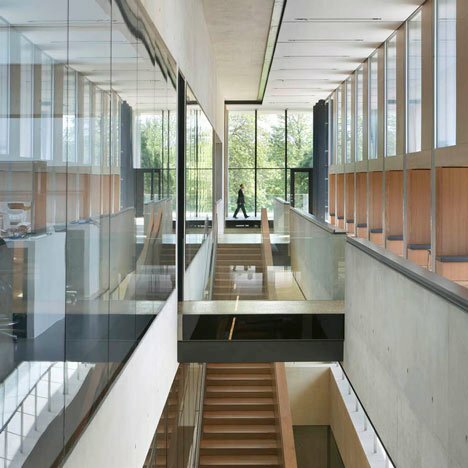 "The social challenge of designing a laboratory is almost as demanding as the technical challenge," Stanton Williams' Alan Stanton told Dezeen at the 2012 RIBA Stirling Prize award ceremony this weekend, where his firm picked up the big prize for their design of the Sainsbury Laboratory in Cambridge, England (+ audio). Located in the botanic gardens of Cambridge University, the laboratory is a centre for plant research and Stanton explained how they designed spaces that would encourage interaction between researchers. "You're trying to get scientists to talk to one another, to share their experiences and talk about the research they're doing, because science then produces accidental discoveries," he said, before explaining how even the location of the coffee machine can be critical to innovation. Stanton also talked about how the laboratory has a special relationship with nineteenth-century plant scientist Charles Darwin, as not only did his tutor at Cambridge plan the surrounding gardens, but there is also a collection of Darwin's plants within the building. "It's the past and the future of plant science," he said. Find out more about the Sainsbury Laboratory in our earlier story, or see more stories about Stanton Williams.